FSHS is the quintessential school of excellence. For over a century, Fairmont Senior High School has been the foundation for thousands of students... ...creating a learning environment where they are challenged to prepare themselves for productive roles in society... …promoting lifelong learning among the graduates over the years... …fostering achievement and honoring accomplishment. Preparing for the future while preserving the building and its rich history, Fairmont Senior High School is listed on the National Register of Historic Places. Acknowledged by Newsweek in 1999 as "cutting-edge in utilizing technology in the curriculum,” the faculty continues to introduce, update, and integrate technology in all disciplines. Fairmont is a community of approximately 20,000 citizens located in the North-Central region of the state, along West Virginia's I-79 High Tech Corridor. Built in 1928 for grades 10-12, FSHS was constructed to be the county showplace. Fire in 1979 could not destroy a school built to last. The 11.5 acre campus on Oakwood Road ranks among the most beautiful in the state and country. The Outdoor Living Classroom of trees with historical significance also cultivates flowering dogwoods, maples, and oaks, which enhance the landscape, makes every season a beautiful environment for learning. No matter what time of year, a flurry of activity is ongoing inside the three-story building and its environs, producing even more awards to add to the already bulging athletic and academic trophy cases. The stately grace of the historic school has an aura that surely reflects the energy of the twenty thousand students most blessed to have received a fine education there from teachers who provided a strong foundation for continued growth and academic excellence. FSHS prides itself on one thing above all else— preparing its students for lifelong learning by stressing quality education, citizenship, and self-worth. Approximately 900 students comprise the ethnic and economic diversity of the school of excellence. Averaging 22.5 years of experience, eighty-nine percent of the faculty have completed or are working on post-graduate degrees. 1864 The first public, free school in Fairmont opens. 1866 The board of education purchases the brick building at the corner of Adams and Madison Streets for a school. 1867 The legislature locates one of the State Normal schools in Fairmont. Thus begins Fairmont High School. 1872 The first high school, located in the Second Ward School Building on the corner of Adams and Quincy Streets, occupied jointly by the normal and public school, houses the graded schools on the first floor and the normal on the second and third. 1875 Normal department separates from the public schools. 1876 Professor Thomas C. Miller, for whom Miller Junior High is named, becomes the first principal of the graded public school system in Fairmont. 1877 The first class graduates from Fairmont High School in the Second Ward Building. 1880 Authorities establish graduating system. There were 227 graduates of record between 1881-1907. 1893 The Normal School moves to its new location on Fairmont Avenue leaving the Second Ward Building entirely to the high school. 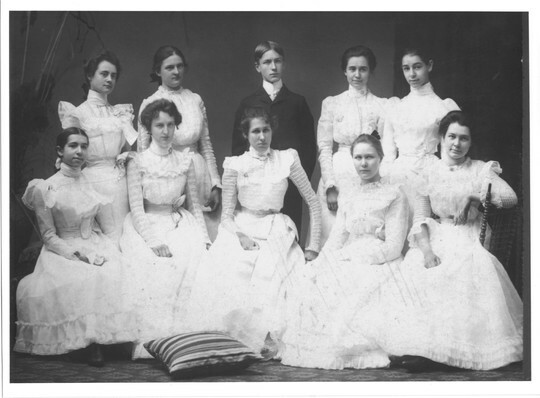 1900 The graduating class, composed of nine girls and one boy, heralds an increased enrollment making it necessary to employ an additional teacher bringing total to four. A new high school facility was envisioned. 1906 Fairmont High School students occupy the new building consisting of 12 classrooms, labs, offices and a library with the top floor used as a gymnasium. 1908 The Junior Class initiates the custom of having a school annual. With their class tree the maple, members call the yearbook Maple Leaves. 218 attend with a faculty of eight. Football team ties for Champions of High School League. 1914-1920 Frank Arnett Ice of Paw Paw District coaches athletic teams known as "Ice's Men". 1920 Students first publish Hi-Life, the student newspaper. 1922 Gym built at 5th Street. 1922 Mr. Ensel Hawkins, faculty, designs seal for Fairmont High School. 1923 Hawkins had seals made in blue and white and used them as merit stamps for work in his department. Principal Buckey decides it would be a good idea to adopt for the whole school, using it as a reward for exceptionally excellent written work. The seal in itself with its 'torch' in the center of 'F.H.S.' might well mean the light or the intellect of the school and, too, that F.H.S. is a light and service to our community." 1926 Polar Bear adopted as mascot. Originally sports teams were called "Ice's Men"; the new mascot honors Coach Frank Ice. 1928 Board erects building on Loop Park. 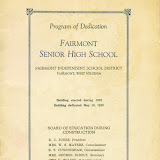 1929 Built at a cost of $491,313.00 the board dedicates Fairmont Senior High School on May 10, 1929. School at Benoni and Fifth then serves as Junior High. The class of 1929, the first to have its graduation exercises in the current building, presents the school with the statue of Abraham Lincoln. National Thespian Society originates in Fairmont WV by Dr. Paul Opp and Mr. Harry Leeper. Two of the three original chapters were East Fairmont High School Troupe #3 and Fairmont Senior High School designated as Troup #2. 1938 School districts unify as one in Marion County; bussing system implemented county-wide. 1946 William Leskovar receives Amateur Athlete of the Year recognition. 1955 Dunbar High School closes as Marion County desegregates public schools. 1958 Larry Drake receives the Kennedy Award as the best football player in the state of West Virginia. 1963 Freshman Building accommodates the addition of the ninth grade as the 5th Street Junior High (former high school) is permanently closed. 7th and 8th graders attend junior high in the Dunbar School. 1964 "Scratches," the school literary magazine, debuts at FSHS. 1968 Students write and produce an original 3 act musical for Thespian Troupe 2. 1969 The Polar Bear Buildings provide "temporary" classrooms for growing student population. 1970 Graduating class donates polar bear statues. 1971 Graduating class presents monument on front lawn. 1976 FSHS celebrates it bicentennial. 1979 February 27, 1979--Fire destroys roof and damages library and top floor. Graduation moves to Woody Williams Armory. 1981 New front steps enhance entrance to main building. 1985 School of Excellence honors FSHS. 1985 Rivesville High consolidates with FSHS. John D. Tennant, principal, adds a touch of red to school colors. 1987 FSHS launches "Project Graduation"; county-wide committee adopts and implements the safe celebration, which continues today. 1989 Beautification ReLeaf campaign plants more then 50 famous and historic trees. 1990 School of Excellence and Exemplary School received from the WV Education Alliance. 1991 Channel 1 televisions installed in every classroom. 1992 FSHS Foundation, Inc. establishes board of directors with a vision to establish funds for student scholarships and teacher grants. Lockers replaced after asbestos abatement, restrooms upgraded, chemistry lab addition to freshman building, room 1. First ever undefeated basketball season. 1994 Construction and dedication of the gymnasium, as well as a parking lot, begins and concludes under the leadership of Superintendent Jane Reynolds with SBA funds under State Superintendent Henry Marockie. FSHS joins Benedum Collaborative. 1995 Multicultural classes, speakers, assemblies, courses, representative flags of fifty ethnicities enhance pride of diverse cultures. Curtains, spotlights, and sprinkler improvements to auditorium with SBA funds of $150,000. 1997 SUCCESS technology grant installs three labs of thirty computers for Language Arts. Closed campus. 1998 FSHS wired to Internet. 1999 The 119th Commencement begins a third century for FHS. Approaching the new millennium, the school celebrates 70 years at its Loop Park location. Intercom system replaced. WFHS TV inaugural season. 2000 GEISA award received Gazette Excellence In Sports Award by The Charleston Gazette for WV All Sports Champion. 2001 Governor Bob Wise addresses the student body the morning after his state- of-the-state address to announce launching "Promise Scholarship Program." FSHS "1000 Voices" fund drive restores auditorium. 2002 FSHS earns listing on National Register of Historic Places, March 22, 2002. Exemplary School recognition from OEPA, Office of Education Performance Audits. Gala celebration of auditorium rededication. Father of rock and roll, Johnnie Johnson, presents concert for the students' return to the auditorium. 2003 Exemplary School recognition from OEPA, Office of Education Performance Audits. 2003-2004 Principal T. Juddson Ashcraft. FSHS Foundation replaces sound system in the auditorium. FSHS joins the SREB High Schools That Work Collaborative. 2006 Exemplary School recognition from OEPA, Office of Education Performance Audits. Kyle Allard named Kennedy Award winner as the best football player in the state of West Virginia. 2007 Exemplary School recognition from OEPA, Office of Education Performance Audits. Honored with Pacesetter Award from SREB High Schools That Work--one of 19 in the nation. Compiled by The High School History Team: Mary Elnora Shingleton, chairman, Sue Helmick, Madalyn Fidler, Mary Bernaldo, Ernest Hutton, and Reedie Miller. One hundred and fifty years ago, even before Marion County came into existence, a small weather beaten log hut was used to teach the “three R’s” to the small children of the early pioneers. This was the nucleus of our present spacious Fairmont Senior High School. In 1819, the basis of a new county was laid when a few settlers made their homes on the farm of Boaz Fleming, situated on the west bank of the Monongahela River. This place was chosen for the new settlement for three reasons: first, because the land there was poor and rough, and not at all adaptable to farming purposes; second, because there was a ferry across the river at the mouth of Coal Run; and third, because there was a meeting-house on a near-by hill, a very important consideration in those days. The settlement was not then called Fairmont, as it is today, but Middletown, signifying that it was midway between Clarksburg and Morgantown, two much older places. During the first few years of its existence, Middletown was but a stopping place for the stagecoach, and the people who made their homes there had no idea that it would ever be more than it was then—a few huts among the briars of Boaz Fleming’s farm. However, on January 20, 1843, Middletown was incorporated under its new name of Fairmont; and on March 26, 1846, a bill was passed making Fairmont the county seat of the newly-created county of Marion. The first schools established were not free, but were maintained by subscriptions. There were no regular buildings; but the master held his classes in a rented room, a stable, a loft, or any available place. Anyone who desired to teach and could get enough subscriptions could hold a school; the only qualification absolutely necessary was that of wielding the rod. However, as the population increased it became more and more necessary to secure some regular means of education, so all the families within a radius of three or four miles united in building a schoolhouse. These first structures were little one-story huts. The school term was three months long, beginning near the first of November and ending toward the last of January. Each pupil paid from 25 cents to $2.00 a term, besides boarding the teacher for a while. The first school in what is now Marion County was in a little log hut with paper windows, which stood on East Run. Mr. Abe Martin taught here in the year 1779, and is believed to have been the first teacher in this section. The second school was established in a small log cabin on Tetrick’s Ridge. Before there was any school near Fairmont, the Jones and Hall School in Hawkinberry Hollow was attended by the local people. Probably the first school located in Fairmont was built on Adams Street near the place where the old Courtney’s store stood. This building had two rooms, one for the girls with Miss Harriet Henderson, as the teacher, and the other for the boys. Another early school was the old Morehead School at the corner of Meredith Street and Cleveland Avenue. One of the most important of these early subscription schools was opened by James White in the old Marietta Hotel building on the corner of Adams and Monroe Streets. 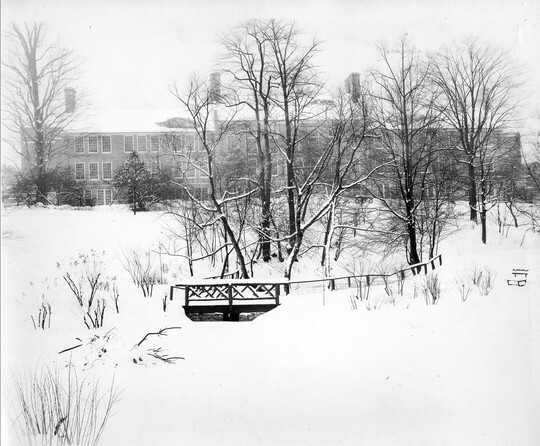 The Fairmont Male and Female Seminary, under the supervision of Professor W. R. White, met the educational needs of the community successfully from 1856 to 1864. The first public free school in Fairmont was opened in the fall of 1864. The teachers for the first term were the Misses Nannie Booth, Maggie E. Turney, and Mary J. Steele. The schools then were ungraded and the term was only three months. There was no building, so rooms in different parts of town were used. In 1865 the schools were graded and placed under the supervision of Colonel J. C. Lininger. The term this year was six months, four buildings being used as schools. In the summer of 1866 the board of education purchased the brick building at the corner of Adams and Madison Streets for a school. Professor A. S. Cameron of Connellsville, Pennsylvania, was chosen principal. He had four assistants and the enrollment was nearly 200. When the legislature located one of the State Normal schools at Fairmont in 1867, provisions were made whereby the pupils of the district could be formed into model training schools, for the benefit of the Normal students; and the principal of the Normal School, by virtue of his position, was the superintendent of public schools. 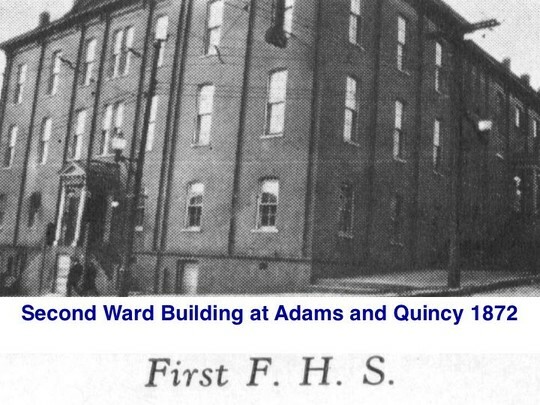 In 1872, a building, known as the Second Ward School Building, was erected at the corner of Adams and Quincy Streets to be occupied jointly by the Normal and public schools. The graded schools occupied the first floor; the normal, the second and third. The plan of the grade schools serving as model schools for the Normal continued nominally until 1875, when the public schools were entirely separated from the Normal department. At this time, Professor J. W. May was chosen the principal of the public schools. In 1876, Professor Thomas C. Miller became principal. Under his supervision at this time, the foundations of the present system of education were laid. At first, the public schools were located on the first floor of this building, while the State Normal School occupied the second and third floors. Later, the Normal School moved, and the high school occupied the whole structure. The building is now owned and occupied by the Fairmont Newspaper Publishing Company. In 1877, the first class was graduated from the Fairmont High School in the Second Ward Building. At this time three rooms exclusive of the principal’s office were being used for the high school. The term was from seven to eight months. The subjects taught were botany, geometry, Latin, higher arithmetic, geology, history, and English which included essays, orations, and recitations. No recreation was planned for the students, and a final examination had to be taken before graduation. The first graduating class had four members: Mary Black, William Pierpont, Kathryn Everett, and Samuel Pierpont. Since the diplomas had not yet been printed, this class received only certificates. In 1878 and 1879 there were no graduating classes. In 1880 only one girl was graduated, but at this time those who had been graduated in the class of 1877 received their diplomas. 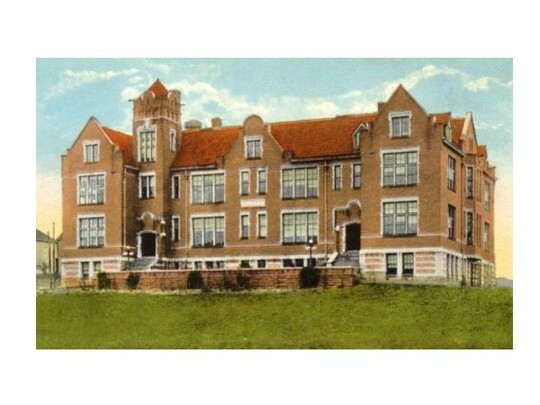 In March 1893, the Normal School was moved to its new location on Fairmont Avenue leaving the Second Ward Building entirely to the high school. The graduating class of 1900 was composed of nine girls and one boy. At the beginning of that year the enrollment had increased to the extent that it was necessary to employ an additional teacher. The faculty now consisted of four members including the principal. By 1905 another teacher had been employed. At this time the salaries of the faculty ranged from $1,350 per year for the principal to $810 and $585 for the teachers. Judge E. M. Showalter assisted by Dr. Joseph Rosier succeeded in showing the need of a new high school building because of increased enrollment and lack of adequate facilities. Bonds were issued amounting to $500,000 and plans were launched for a new high school. The “Point” at Fifth Street and Benoni Avenue was chosen as the site of the building, with the actual construction beginning the following year. The corner stone was laid by the Masonic Lodge, with the school children participating in the ceremonies. By 1906, the new building was completed at a cost of $80,000. It consisted of principal’s offices, library, twelve class rooms, physics and chemistry laboratories. The top floor was used as a gymnasium; the basement, for manual training and storage. This building housed the Fairmont High School during the years 1906 to 1929 when it was given over to the Fairmont Junior High School. Classes moved into the new school at 5th and Benoni in 1906, and it was occupied until 1929. 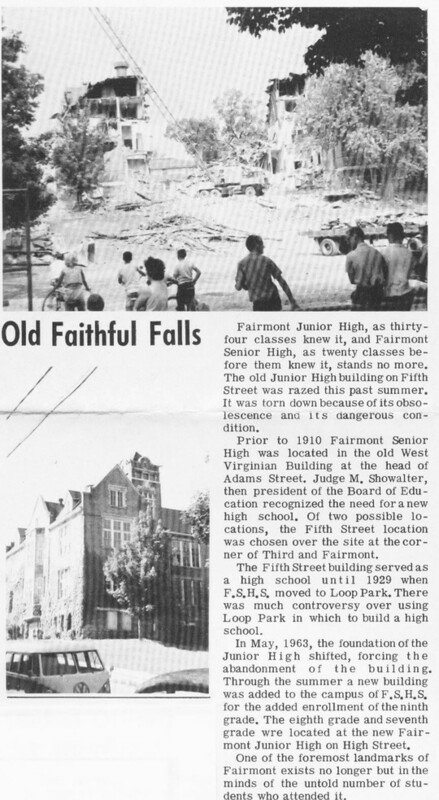 It was then converted into Fairmont Junior High School, under a new school system. A gymnasium was added, at the rear, in 1922. Athletics were introduced in 1907, with football, baseball, and basketball making up the sport curriculum. Three courses of study were offered at this time: (1) English for those pupils who did not wish to study foreign languages; (2) Literary for those who desired to study one or two modern foreign languages, French and German: and (3) Classical which included the study of Latin and other work which prepared the pupils for college entrance. The requirements for graduation in 1907 were the completion of 152 hours of work for each course in which the pupil enrolled, or 19 recitations a week. Chemistry was added to the curriculum, which included mathematics, modern languages, Latin, English, science, history, art and music. Blue and white were adopted as the school colors and have remained the same since then. The junior class in 1908 initiated the custom of having a school annual. This year book, since the class tree was the maple tree, was called the “Maple Leaves” and has been published yearly since 1908. By 1910 there were 13 faculty members including the principal. In 1912 manual training and domestic science were added to the subjects already offered, making 12, with 17 faulty members. This same year Student Government was introduced into the school with the organization of the student council, consisting of 2 members from each class. Physical education for girls was added to the list of subjects offered in 1913 and has grown in importance until it is now required for graduation. A new system of organization in the school was begun in 1914, with the home room and group system being inaugurated. The growth of the school can best be illustrated by the school library. It is the largest in the state, containing 2,456 volumes and was used by 185 pupils daily. The variety of subjects offered had increased greatly too. English, music, French, Spanish, commercial subjects, history civics, agriculture, dramatics, Latin, domestic art, botany, biology or general science, chemistry, physics, and domestic science were now taught. It was during this period that there was a rapid development in the growth of extra curricular activities; Camp Fire circles, debating societies, literary societies, Hi-Y, glee club and orchestra were the chief ones organized. The first school paper was published in 1921 under the direction of an elected staff. The paper has been published every year since then and has retained its original name of Hi-Life. The construction of a building was begun the following year for use as a gymnasium with facilities for a full physical educational program. This building is still used for interscholastic games, being known as the Fifth Street Gym. Loop Park, long a beauty spot of Fairmont, is the site and campus of Fairmont Senior High School, embracing a tract of 11.5 acres. The building was occupied in 1929. The above view is seen from Oakwood Road. It was decided in 1927, to adopt the 6-3-3 plan of school organization in Fairmont. If this were to be done, an additional building was necessary to house the senior high school. After several months of debating, plans were made to build the new school in Loop Park, a picturesque site of 11 acres, which had been purchased by the school board in 1923. The actual construction began in January 1928 and was completed by the spring of the following year. 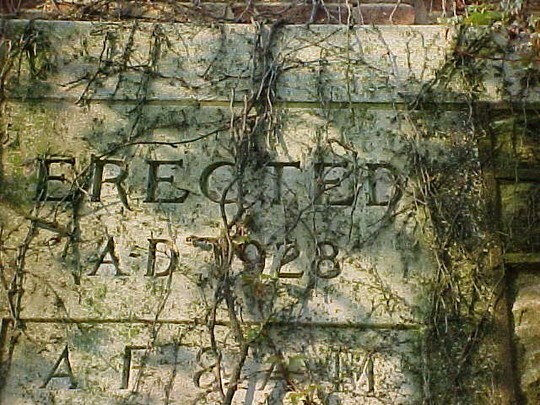 The cornerstone appears below. The class of 1929 had the first graduation exercises in the new institution. Although they attended school at the 5th Street location, they walked across the stage in the new auditorium on Loop Park to accept the diploma. This new building, on of the most modern and well equipped in the state, has an auditorium, seating 1100; a little theatre is available for supplementary auditorium activities, dramatics, music, and public speaking. A gymnasium is provided with ample facilities for both boys and girls. A cafeteria with the most modern electrical equipment is provided for those pupils who remain at the building for lunch. The home economics department consists of the latest kitchen, sewing, and house-keeping equipment. The commercial department offers all facilities for instruction in typing, bookkeeping, and office practice. Included in the boys’ shop are mechanical drawing, woodworking, auto-mechanics, and building trades. The library contains approximately 3,500 volumes. A modern telephone system, within the building, and bells controlled by electricity provide rapid communication and change of classes. 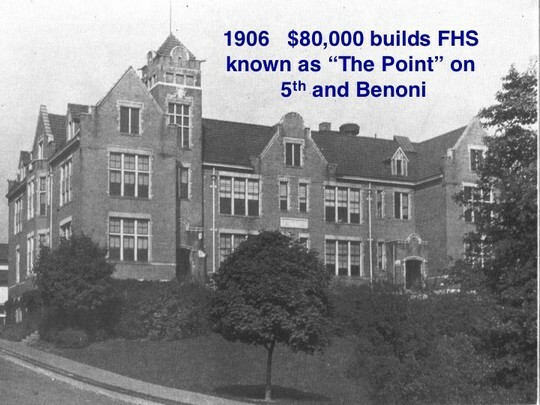 The total cost of the building was $491,313.69, supported by bonds sold in 1927. With the transference of the high school to the new building, a larger teaching staff was required. Fairmont Senior High School now has a faculty of 30 members including the principal, Mr. W. E. Buckey who has been here since 1921, a librarian, and a secretary. In addition to the scholastic work, extra-curricular activities afford a wide scope for the broadening of the pupils. Football, basketball, baseball, boxing, wrestling, golf, tennis, and track are among the chief athletic activities. The National Honor Society, National Thespians, National Forensic League, Hi-Y, Girl Reserves, and clubs connected with classroom work make for a varied program. The high school ceased to be under the control of an independent board of education in 1933 when the county unit system of school control was adopted by the state of West Virginia. Fairmont Senior High School, the building, the campus, the faculty, and the student body, illustrate the attainments achieved in the 159 years of the history of education in this community. 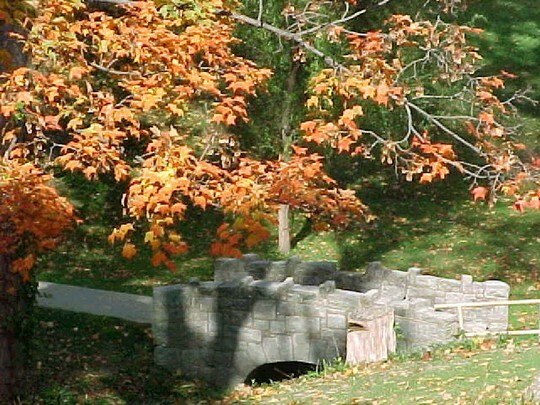 The artistic stone bridge crosses a bubbling brook on the campus of Fairmont Senior High School. Many legends are told concerning the Indian tribes who frequented the banks of the stream. A small portion of another part of the beautiful campus is visible. Dunnington, G. A., Marion County History, Dunnington, Fairmont, West Virginia, 1880. Fairmont High School Office Files. History of Education in West Virginia, 1907. Minutes of Fairmont Independent Board of Education. Newman, Dora Lee, Marion County in the Making. During the late 1800’s Fairmont began to emerge. The coal mines began to fuel Fairmont’s economy. The first telephones were installed and electric lighting arrived. The first free public school also opened. The first class graduated from the school in 1877. A graduating system was established in 1880, which graduated 227 students from FHS, which later became known as FSHS, between 1801-1907. By the early 20th century, manufacturing plants began to emerge. The Fairmont-Clarksburg- Weston streetcar line was completed which brought people into the city and helped with the economy. The first Fathers Day service also took place in Fairmont at the First United Methodist Church. Just under 40 years after the first was built on Madison Street, FSHS was moved to 5th Street and Benoni Avenue. In 1906, students began to use the new school. Students also began running the annual yearbook, Maple Leaves, two years after moving into the new building. The 1920’s brought a connection between east and west Fairmont. The high level bridge, which connected east and west Fairmont, joined at Merchant Street and Jefferson Street. WMMN, Fairmont’s first radio station, went on the air. As Fairmont changed, so did the high school. The school built a gym in 1922 and the school seal was created. A mascot, the polar bear, was adopted in 1926 to honor coach Frank Ice. However, by 1928, the school was ready for yet another move. The Board of Education erected a building on Loop Park and on May 10, 1929 dedicated the new building. The class of 1929 did not attend school at the Loop Park location, but were able to walk across the stage and receive diplomas. The class donated the statue of Abraham Lincoln, which remains in the main hall of the school. This is the continuation of a "Just Observin'" by Oce Smith as it appears in the Times West Virginian column which we began on these pages a few weeks ago regarding an Olde Fairmont which, ever so sadly, no longer exists. • Minnie Monell once told this Irregular Columnist that during the war years and directly after that time, she had been awaiting a small down­town location for several years to open a little hot dog stand, and when one very, very small and compact place became available; 8 x 24, we believe she said, up on the fourth block of Adams Street for $150 plus utilities per month (probably equivalent to $800-$900 today), she jumped at the chance, and she made money, primari­ly late of an evening and on the week­ends! Today, sadly, there are no blue collar workers to come to town on a Saturday night to have mostly benign fun, while the missus goes shopping from one end of Adams Street to the other, and whose kids giggle and have the time of their lives frequenting everyplace but no place - and with all of them dropping a few dollars along their way. On Saturday afternoons the smaller of the children could, for a quarter, take in a Gene Autry or Hopalong Cassidy flick at the old Virginian Theater: Fifteen cents for entry, and a nickel each for a little sack of popcorn and a small cup of Nehi Orange soda pop - or if they wanted to show their friends they were a real sport, a Royal Crown Cola. It was also a habit for a family to come to town, usually on a Saturday evening, but often on other occasions during the week, too, after which mother went shopping at "G. C. Murphy & Co." and other such retail outlets, while the kids went to the moving picture shows, and the old man slipped off to Lloyd Benett Ganoe's "Slack's Pool Room," Augustino "Bootsie" Rombola's "Madison Hotel," Henry Cohan's "Majestic Pool Parlor and Shoe Shine Shop," "Dolly" Serian's "Birdland," and various other vary small barber shops and dens of iniquity located throughout the downtown area; many "down under," in restructured base­ment areas beneath otherwise calm and respectful retail establishments - such as Tommy Hartlieb's popular "Palace Poolroom" across Adams Street from the old First National Bank, and a number of others. Commercial space was then at such a premium that landlords and tenants would "make do" with virtually any­place which could be turned into a bit of cash. The ladies then would often treat themselves to a joint Dutch Treat luncheon down at Spiro Gotses's won­derful old "Palace Restaurant" - while their spouses or the older chil­dren would invariably end up at "Yann's," "Lupo's," "DeMarco's," or later "Monell's" for the most mouth­watering hot dogs or hamburgers which were ever allowed on this Earth. Then, that night the young adults would suddenly converge upon Merchant Street: "Champ" DeBlasio's "Army/Navy Club," either the "Three Dot's Club" or the "Ten High Club" of "Potty" Morrison (We now forget which), the "Ribels' "Orioles Club," and other spots of similar jurisdiction - and Nick Hando's restaurant was always handy right there on the corner at any hour, to polish off a fun filled night. That thoroughfare once even reached the heights of repute, when it was allegedly learned by Time Magazine that Merchant Street was home to the more illicit bars and speakeasies, per linear foot, than any in the country. The ironic part about this street, through, is the verity that at the same time it was the location of Dominick Potesta's Hardware Store, Johnny Phillips & Bill Harvey's gasoline serv­ice stations, Alice Bennett's Pharmacy, Dr. Edgar B. Reese's dental offices, a large transfer and trucking company, the State Liquor Store, the Carpenter & Ford Funeral Home, a large grocery store, and some other establishments of great repute. Now, to say that those days are gone would be the understatement of all time! All that is left is the funeral home, and it has been totally renovat­ed. The drug store has changed hands and been moved. Also, while this might be difficult to believe, perhaps the most "wide-open" street in the nation was patrolled, com­pletely and effectively, by one very old, white haired, slightly stooped shoul­dered policeman, who continually strode up and down the street swinging his night stick in his hands like they did in the old 1930's movies - and keep­ing the entire scene in check. We now forget his name, but if a rowdy bunch got out of hand, all he had to do was to walk relatively slowly over to the crowd, point his night stick at them, and declare, "Now, boys, you know better than this. So break it up and get out of here," which is exactly what they would do. Once in a while on a cold night, he would drop by "Hando's" momentari­ly, and Nick would draw a courtesy cup of hot coffee for him. Also, out in the county small towns and cities operated in much the same manner. They were all what were then called, euphemistically, "Saturday Night Towns." In those days very few coal miners and factory workers possessed the lux­ury of their own automobiles. Therefore, a large contingent of them couldn't get into Fairmont, and they were compelled to find their own entertainment right there where they lived, bringing about the continued growth of beer joints, poker palaces, poolrooms, speakeasies, lounges, houses of ill fame, bars and other dens of iniquity. The general philosophy was that so long as no one really got hurt in the process, allow these fellows a place and a method to vent their spleen and have a little bit of rowdy fun while doing it. Most of the regions were run by their own democratically chosen govern­ment anyway - except for Barrackville, which at that time wasn't incorporated but was really two towns in one; the coal camp, usually called "No. 7," although by that time was real­ly "No. 41," and the old "Barrackville Proper" - which in itself had once been divided between the old, original Barrackville out to the north of the cov­ered bridge, and the new Barrackville, or the one time Blairsburg, down on the Fairmont end of Barrackville. The mining camp half of the town was totally located across Buffalo Creek and up to the north-western direction, and was originally pur­chased from the Conaway family and developed by the Jamison family and their coal company shortly after the turn of the 20th century. Additionally, due to the communica­tions and transportation styles which they were then forced to use, they opened a mine which they called "Dakota," down on the road between Fairmont and Rivesville, which was the "sixth" mine which they then owned. Then they opened the Barrackville mine, which was their "seventh" shaft, and then just up the road a couple of miles was their "eighth" mine, and one in above Farmington was their "ninth" mine. Later, however, Eugene Grace of the Bethlehem Steel Corporation created a subsidiary called "Bethlehem Collieries" and purchased those three mines from the Jamison Works, and possibly some others - plus Ida May, Carolina and others from the Watson interests, and then Barrackville's old "No. 7" became their "41st" facility. However, to most residents of Barrackville, it forever remained old "No. 7". They soon closed down the "Dakota" and the "No. 8" operations, and a few years later the facilities at Carolina. However, they continued to mine out at Barrackville and Ida May as two No. 1, first class operations until the coal ran out, But the remainder of the outlying Marion County towns pretty much ran themselves - and small portions of most of them were pretty much con­trolled on their own. In the early days coal affected Mannington only in a peripheral way. It was a very wealthy little city, at one time it drawing more persons for both a business and a pleasure genre that any smaller municipal corporation except Sistersville in the state. However, its wealth came primarily from gas and oil, and from state Sen. George Bowers' old "Mannington Pottery Works." It was already a major port of call on one of the old "B & O'" Main Lines, as were Barrackville and Farmington, as well as Fairmont. Assuredly with no disrespect intend­ed, but for those three towns, as well as for Fairview, Rivesville, Fairmont's Winfield/Meadowdale area, and to some extent the village of Worthington, coal was some­thing of an afterthought. It appeared that very often the grantors of coal rights were somewhat more erudite than were the grantors of gas and oil rights. Most of the time old farmers seemed to allow their gas and oil rights to be taken from them for virtually nothing, while coal grantors, at least, demanded and received a great deal more for their mineral rights. The late James Lawrence Conaway once recalled to this Irregular Columnist how the real estate agent for the Jamison coal interests came to his dad or grandfather, whichever, offering a proposal to purchase the coal rights to hundreds of acres which the old man then owned up on the north side of Buffalo Creek, and which was much too craggy, rough and hilly to be usable for anything relating to agriculture. Therefore, after the old fel­low agreed to sell it to them, they asked him the price - and when he gave it to them, they were absolutely aghast. One of them finally stuttered out a response that "we could buy the minerals and the surface and the whole damned place for that!" to which Mr. Conaway answered, "You just did. It was never going to do me any good!" Old Mr. Sturm answered the same way when he sold what eventually became the "Annabelle" or "Four States" shaft and camp in above Worthington and up at the head of Teverbaugh. However, Grant Town, Baxter, Rachel, Chesapeake, Chatham Hill, Monongah, Ida May, Carolina, along with indi­vidual, very, very segregated sections of Barrackville and Rivesville, grew up directly out of the black bowels of the earth to sprout a bountiful, if danger­ous, economic future for thou­sands and thousands of persons over the next three quarters of a century. However, all of these people, in addition to the community dweller, the farmer and all oth­ers poured into Fairmont for all of the commercial and person­al entertainment chapters of their lives on every day of the week, and especially on a weekend. At that time we were home to large coteries of retirees and the elderly, but the bulk of our population was made up of younger or middle-aged citi­zens, who were still active and reigning as the predominant portion of our demographics. And we were the home offices to the highest echelon of such corporations as the Consolidation Coal Co. and the Monongahela Power Co.
Fairmont was indeed the sub­stantially understood Queen City of North Central West Virginia, while the County of Marion reigned certainly as one of the kings of the counties. Can we ever get some of it back? · This subject will be com­pleted with another "Just Observin'" column on these pages.